On April 15, 2011, the International Criminal Tribunal for the former Yugoslavia (ICTY) handed down the sentence for three Croatian Generals: for Ante Gotovina, 24 years in prison; Mladen Markač, 18 years of prison; and Ivan Čermak who was immediately released. Gotovina and Markac were accused on charges of “crimes against humanity and violations of the laws and customs of war” committed in 1995 by the forces of their country during “Operation Storm“. Hay que manifestarse Internacionalmente contra esta Sentencia de La Haya dónde se le faltó el respeto a la Nación, al Estado Croata y a sus Héroes de la Independencia. Pero no solo con papeles ó declaraciones, hay que MOVILIZAR A LA DIÁSPORA DE TODO EL MUNDO, salir a repudiar (Pacificamente) pero con movilización de masas en las calles, con PRESENCIA PERSONAL EN LAS INSTITUCIONES, hacerles sentir que hoy el CROATA ES UN LEÓN HERIDO !!!!!!!!!! We must protest internationally against this sentence from The Hague which lacks respect for the nation, for the Croatian state and its independence heroes. But not only with papers and declaration, we must MOBILIZE THE DIASPORA OF THE ENTIRE WORLD we must repudiate (peacefully) but with mobilization of the masses in the streets, with PERSONAL PRESENCE IN INSTITUTIONS, we must make them feel that today CROATIA IS AN INJURED LION!!!!!!!!!! 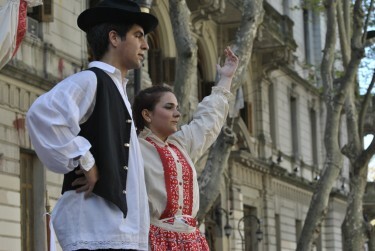 Croatian collective of Argentina in action on the Avenida de Mayo. Photo: Laura Schneider. Después de que Croacia proclamara su independencia en un referendum democrático e inequivoco, los serbios (12% de la población) que habían vivido durante siglos en lo que ahora era un país independiente tenían varias opciones para encontrar un marco en el que sentirse cómodos y diversos modelos políticos posibles para acomodar sus especificidades. En cambio optaron por la peor vía posible, la secesión armada. Ayudados por el Ejército Yugoslavo, dominado por los serbios, se levantaron en armas contra las autoridades croatas demasiado débiles para hacerles frente, y proclamaron la República Serbia de Krajina, que ocupaba las zonas en las que los serbios eran mayoría. After Croatia had proclaimed its independence in a democratic and unequivocal referendum, Serbians (12% of the population) that had lived for centuries in what what was now an independent country had various options to find a framework in which to feel comfortable and various possible political models to accommodate their specific needs. Instead, they opted for the worse route possible, armed secession. Assisted by the Yugoslavian Army, dominated by Serbians, they raised arms again the Croatian authorities who were too weak to face them and proclaimed the Serbian Republic of Krajina, that occupied the zones where Serbians were the majority. When Operation Storm was launched, the president of the Serbian Republic of Krajina, Mile Martic, asked that Serbians in Krajina abandon the zone with which Croatia recuperated the territory designated as the Serbian Republic of Krajina. Gotovina fue uno de los principales comandantes de la ‘Operación Tormenta’, razón por la cual está considerado un héroe entre los sectores más nacionalistas de su país. Pese a ello, en 2000 fue apartado del Ejército por el presidente Stjepan Mesic por oponerse a cooperar con el TPIY [Tribunal Penal Internacional de la ex Yugoeslavia]. Gotovina was one of the principal commanders of ‘Operation Storm’, the reason for which he is considered a hero among the more nationalist sectors of his country. Nevertheless, in 2000 he was separated from the army by President Stjepan Mesic for refusing to cooperate with the ITCY (International Criminal Tribunal for the former Yugoslavia). En 2003, Gotovina exigió que se le interrogase en primera instancia en Zagreb como condición para entregarse al TPIY. Mesic le apoyó, pero el tribunal insistió en su entrega incondicional. In 2003, Gotovina requested that he be interrogated in the first instance in Zagreb as a first condition to handing himself over to the ICTY. Mesic supported him, but the tribunal insisted on his unconditional surrender. Ante Gotovina, el criminal de guerra más buscado de Croacia, ha sido detenido en Tenerife, según ha anunciado la fiscal del Tribunal Penal Internacional para la ex Yugoslavia (TPIY), Carla del Ponte. Gotovina supervisó la matanza de al menos 150 civiles serbios y la deportación forzosa de unos 200.000. Nueve agentes de la Policía Nacional lo detuvieron anoche en el hotel ‘Bitácora’ de Playa de Las Américas, mientras estaba cenando. Ante Gotovina, the most sought out war criminal of Croatia has been detained in Tenerife, according to the announcement of the Prosecutor of the International Criminal Tribunal for the Former Yugoslavia (ICTY), Carla del Ponte. Gotovina supervised the killing of at least 150 Serbian civilians and the forced deportation of some 200,000. Nine agents of the National Police detained him yesterday in the ‘Bitácora’ hotel on Playa de las Américas, while he was dining. Once captured and taken into custody in The Netherlands, Gotovina declared himself innocent and joined his cause with that of Marcak and Cermak within Operation Storm. It was not until March 2008 that the judgment against the Croatian generals started, according to the website of the International Tribunal. During the search for General Gotovina, Croatia initiated the process to become a member of the European Union. The blog Columna Crítica [es], comments that cooperation in the search for Gotovina was one of the requirements that they had to complete in order to enter the European Union. Hasta 30.000 croatas salieron a las calles de la capital Zagreb el fin de semana para protestar contra el encarcelamiento de dos generales por crímenes de guerra en las guerras de los Balcanes el viernes. Los manifestantes llevaban pancartas que decían “Amo a Croacia, no en la UE”, y “¡Fuera UE!”. También escupieron y quemaron la bandera de la UE en la céntrica Plaza Bana Jelacica. Up to 30,000 Croatians went into the streets of the capital Zagreb this weekend to protest against the imprisonment of two generals for war crimes in Balkan wars on Friday. The protesters carried banners that said “I love Croatia, not the EU”, and “Get out EU!” Also they spat on and burned the EU flag in the center of the Bana Jelacica square. 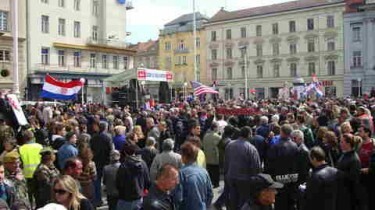 Protest in Zagreb square against The Hague verdict. Photo: Jadran Perkovic, used with permission. La inmigración Croata a la Argentina se divide en tres grandes corrientes: las dos primeras (Y MAYORITARIAS POR ABRUMADORA CANTIDAD) son anteriores a la IIº Guerra Mundial (como el caso de mis abuelos), la tercer corriente es posterior a la IIº Guerra como tu dices (pero no todos los que vinieron en esa epoca apoyaron al régimen de Pavelic´, muchos fueron civiles PERSEGUIDOS POR LOS COMUNISTAS DE TITO POR SU CONDICIÓN DE CROATAS – los cuales estaban proscriptos, ser Croata o Católico durante el Comunismo era motivo de persecución – ADÓNDE ESTABA TU EUROPA Y LA HAYA EN ESOS TIEMPOS ??? – SABÉS DE LAS FOSAS COMUNES DEL COMUNISMO QUE SE ENCONTRARON NO HACE TANTO TIEMPO CON MILES Y MILES DE CADÁVERES DE CROATAS ??? ). Dios nos protege a los croatas siempre y nos envía a Su Madre para dar tantos mensajes de Paz, que Ud no debe tener…Gotovina no será un santo, pero de seguro Ud tampoco! God always protects us the Croatians and sends us His Mother to give so many messages of peace, that you should not have … Gotovina will not be a saint, but you certainly, neither are you! Los croatas tenéis que confrontar los crímenes que vuestro ejército hizo en nombre de la independencia. Es obvio que no estáis preparados, pero ya os acostumbraréis. Muchos años los croatas jugaron tal y como están jugando ahora, haciéndose víctimas…. Croatians have to confront the crimes that their Army committed in the name of independence. It is obvious that they are not prepared, but they should already become accustomed. Croatians played many years as they are playing now, making themselves victims…. Repudiamos sin ambages la sentencia, especialmente en cuanto cuestiona los fundamentos del Estado Croata y su propia existencia. La sentencia trastoca perversamente toda la cuestión: el agredido es culpable por defenderse. Pretende re-escribir la historia.Rechazamos de plano todas las tendencias y acciones yugonostálgicas y balcanizantes, provengan de donde provengan. We repudiate in plain language the sentence, especially in how much it questions the foundations of the Croatian State and its existence. The sentence perversely overturns the entire question: the attacked is guilty for defending himself. Pretending to rewrite history. We flatly reject all Balkanized and Yugo-nostalgic tendencies and actions, from whatever quarter. I am writing you this mail with the intention that you will send this letter of support to the Croatian patriots Ante Gotovina and Mladen Markac…I hope that at least a million letters arrive to them in The Hague. Tan cansado de la justicia española, de vez en cuando la justicia en La Haya me devuelve la esperanza. Krajina, el apéndice de Jasenovac no ha quedado del todo impune.. So tired of Spanish justice, every so often justice in The Hague gives me hope again. Krajina, Jasenovac's appendage hasn't gone unpunished. The tribunal concluded its verdict and the defense and the accused have the right to an appeal. 100 % Serbio, y orgulloso ortodoxo. Hola amigos ! soy serbio y vivo en Uruguay hace ya varios años, producto de la operacion oluja ( Tormenta )por parte del Ejercito Croata vine a dar a suramerica. yo me fui de Croacia porque vi lo que pasaria, cuando compatriotas mios se portaban mal frente a las autoridades Croatas, eramos muy pocos los que respetabamos y haciamos caso a Zagreb, mal que mal todos nacimos en Croacia esta es nuestra patria aunque seamos serbios, pero la mayoria querian anexar esta zona con Serbia. Pdt: Gotovina es un heroe, incluso yo lo pienso asi el defendio a su pueblo, de gente de mala calidad entre los serbios.